Dreams. We all have them, but we don’t always get to see them become reality. But that’s the beautiful thing about being a dreamer: there is always something to push towards, something to strive for. Our team had the incredible opportunity to help a vision and dream come true. Krochet Kids intl. launched their Peru location over a year ago, and an awesome man named Blake led the way. He, his wife, and four kids moved from Southern California to Lima, Peru, building the Peru factory from the ground up. Krochet Kids? What is that? If you haven’t heard of Krochet Kids intl. yet, then pay attention! This organization is really amazing. Now, there are few things that excite me more than social entrepreneurship. I’ve had the pleasure of working for a really amazing company that sort of launched the philanthropic business model into mainstream America, and I love seeing what these companies can do. Krochet Kids is all about sustainability (among other things). What sets them apart from the rest of the companies that go into other countries and set up factories, is that not only do they provide jobs for the people who live in the area, but they also set out to educate and mentor them so that they can take what they learned and bring it into their community. Empowerment! Because mentoring is such a big piece of what Krochet Kids does, Blake had a vision for what their mentoring space would look like. He and Danny schemed and dreamed together, and came up with a blueprint/plan for what the space could look like. It involved tearing down walls, building walls and doors, repainting the entire space, and yarn bombing. They also wanted to provide chairs for the women (previously, they would have to bring their chairs from the factory across the street, up the stairs that can only be described as a steep climb, and into the room in order to sit on something). What you don’t see are the 10 chairs that we had to sand and repaint, the three counter/cupboards that needed to somehow get into the space and sanded and refurnished, and the art that we wanted to include to brighten up the space. It may have seemed like a daunting task, but we were up for the challenge! Each morning when we arrived, we assessed what needed to be done and then got to it! There were a few hilarious, yet dangerous moments. Like when Josh and Jose perched precariously on a ledge three stories up as a team of men lifted really really heavy counter/cupboards up to them. Or when Alicia, Josh and Andres experienced an electrical fire and someone (ahem) tried to fix it by sticking a screwdriver into the open wires. Or when our entire team was inhaling paint fumes for hours on end... it was only until Danny was giggling that we realized we probably needed a break! It was hard work, for sure. And there were times where we weren’t sure we’d be able to get it done! But the beauty of it all was how our team of rag tag people (some more muscular than others) banded together, and did what needed to be done. There was no complaining, just picking up a paintbrush if something needed another coat or handing the hacksaw to Josh when something needed to be cut. We lifted, sanded, sawed, hammered, painted, and scrubbed. It wasn’t all work, there were definitely moments of joy. Like, when Kori, Amy, Kelly and Grace yarn bombed two of the posts in the room. Or when Lauren and I hammered in nails to create a KKPeru wall hang. Or when people started singing along to Justin Beiber when he came up on my playlist! We had an awesome “reveal” for the women on Thursday, which also happened to be our Fourth of July. We had rotisseried chicken and potatoes, and showed the women the space for the first time after the remodel. It was just an incredible moment, seeing all of our work come together and then getting to spend some time with the women and their kids. At the end of the day, this is what “missions” is about. I put the word “missions” in quotes, because technically we are called by God to serve the poor, the needy, the hungry, the orphaned, the widowed, as a part of our every day lives. So our time in Lima was just another opportunity to be mirrors of Christ (remember my Justin Timberlake post?). But this is what it is. Partnering with other believers, figuring out what needs are in the community, and then finding ways to address those needs. 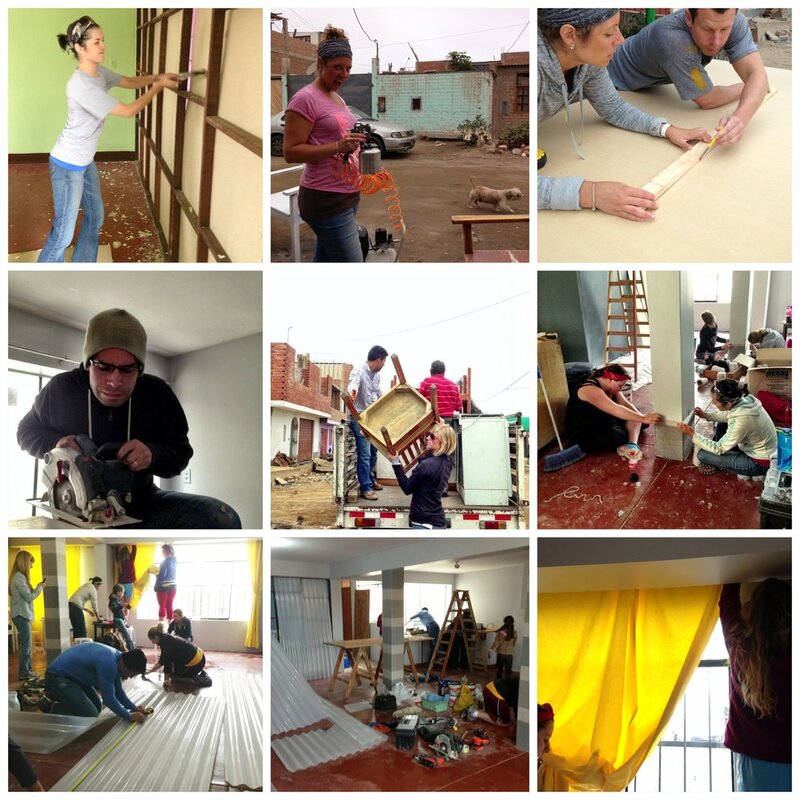 On the surface, the KKPeru project was a chance to beautify a space. Goodbye lime green walls, hello bright yellow curtains. But in reality, it was much more than that. Because of the additional room we built, the mentors will now be able to double their time with the women. Instead of only being able to work with one person at a time, both mentors can sit down and teach, listen and help two women. The counter space allows the KKPeru team to keep notes and binders where the women will be taught. And instead of lugging chairs from the factory to the mentor space and back, that time can be added on to the teaching time.